If you want to be an orthodontist, you have at least 10-12 years of schooling ahead of you. Orthodontists are very similar to dentists, but they perform completely different tasks in an office than a dentist would do. This is why you need to see both an orthodontist and a dentist if you have braces. See what services they provide that no one else can! Want to Become an Orthodontist? To become an orthodontist, a person has to commit to at least 10-12 years of education, training, fellowships and more. Even after that time, and orthodontist must continue testing and studying throughout the years in order to do orthodontics. An orthodontist is a professional that specializes in correcting crooked smiles, bite and alignment issues, jaw problems and aesthetics of the mouth. 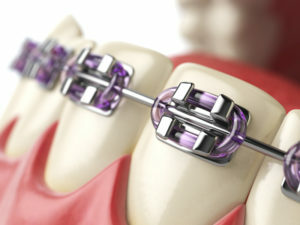 They do this through braces, which commonly consist of metal bracket and wire appliances. Those appliances mold the teeth and jaws into specific alignments and positions. 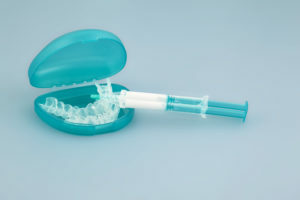 Through focused pressure with these mouth appliances, a person with major bite, alignment, or crooked teeth problems can find themselves with a beautiful, functional smile. This is especially beneficial for patients who have oral health problems that cause them speech impediments and difficulty biting, chewing, speaking and functioning normally. An orthodontist is a step above a dentist when it comes to their schooling. To become an orthodontist, a person must complete 4 years of undergraduate schooling at a university. They then apply for dental school and must be accepted. After 4 years of dental school, many students become dentists. However, orthodontists must continue to do at least 2 more years of orthodontic school and fellowships to do orthodontia as a profession. 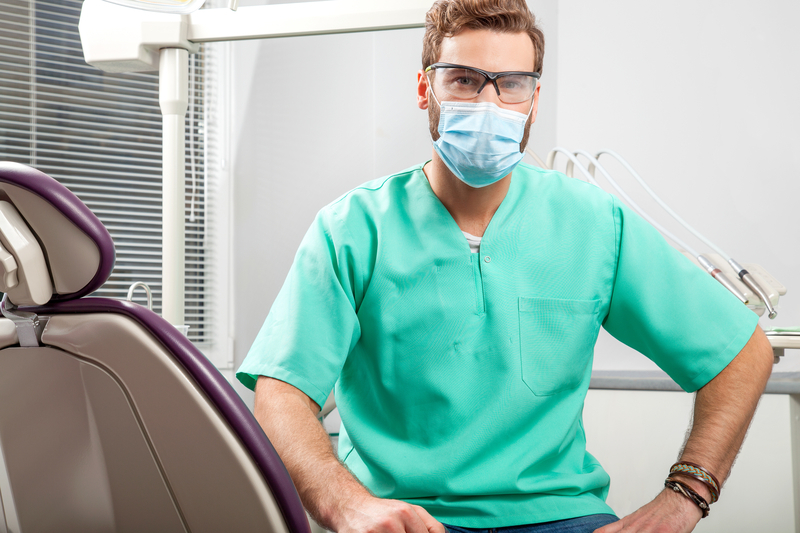 Even though orthodontists are trained in dentistry, they do different work than dentists. They provide services such as correcting misaligned teeth and smiles, overbite, underbite, crossbite, and other alignment issues. Some are trained to provide surgical orthodontic procedures, or they work closely with an oral surgeon in correcting a misaligned jaw. For patients who receive surgical orthodontics, an orthodontist will provide pre-surgical orthodontic care to align teeth and jaws as much as possible. A patient will then have oral surgery done to correct issues that can’t be done without surgery. Then, the jaws and teeth are aligned to their final, complete position through orthodontic appliances. If a patient doesn’t receive surgical orthodontics, they generally do 18-24 months of braces to straighten their teeth. Primarily, this is what an orthodontist does: they design braces (based on what type you pick) that fit your smile and that can shape it straight over the course of 1-2 years. Both dentistry and orthodontics focus on oral health and improving a person’s smile. However, dentistry primarily strives to clean the teeth, fix tooth decay, perform root canals and treat gum disease. Patients also receive dental crowns, bridges and implants, and many cosmetic dentistry procedures. If you need teeth whitening or want to improve the look or health of your teeth, seek out a dentist. 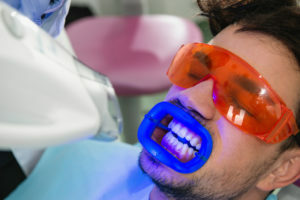 They can perform teeth whitening services, provide dental veneers and implants, and can help with oral health diseases. However, if you need your teeth straight in the first place, you need an orthodontist. The American Dental Association recommends that every patient see a dentist at least twice a year to avoid major oral health diseases. You will need an orthodontist at various intervals in your life. However, you don’t see them as frequently throughout life like you would a dentist. When you have crooked teeth or problems with your jaws or alignment, you work with an orthodontist to fix the major issues. Then, a dentist fixes the more minor issues like the color of your teeth. A dentist is not trained to straighten the teeth even if a dental office provides a transparent aligner service such as Invisalign. You always want to choose a trained orthodontist for properly straightening your teeth so oral issues don’t arise. When battling tooth decay, gum disease, bad breath and more, seek out a dentist. If you want to correct jaw, teeth, alignment, and bite issues, seek out an orthodontist. 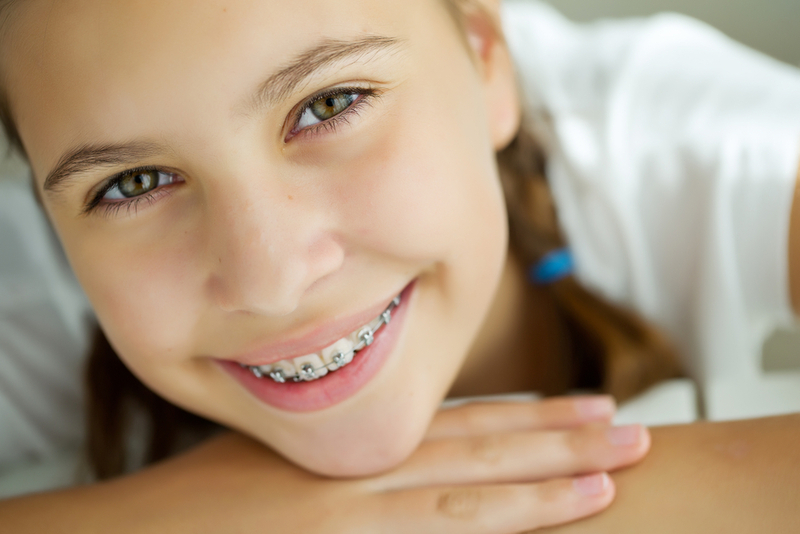 You may find yourself visiting both often if you receive braces as a child and then later as an adult or teen. 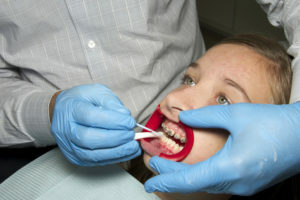 Most orthodontists are trained to correct jaw and bite problems in children. You should always take your child in to see an orthodontist by age 7 if you already haven’t. The American Association of Orthodontics recommends this, as major bite and alignment issues of the jaws and teeth can be corrected easily when young. As a person grows older, the jaw hardens and becomes more permanently fixed, and oral health problems are much harder to correct. If you are deciding to invest in braces, take a look at your teeth. Are they crooked? Do you find that either the upper or lower jaw overlaps the other significantly? Do you have problems speaking, eating, biting or chewing at times? You could benefit from orthodontics! Most people can significantly improve their oral health and their happiness (from having a beautiful smile) if they choose to see an orthodontist for help with their smile. Dr. Hardy is an award-winning orthodontist. He is an active member of the American Dental Association and the American Association of Orthodontics. Dr. Hardy works with a team every day to make sure his patients young and old are cared for. At his center, he offers patients the option of getting ceramic, clear braces, traditional metal braces, lingual braces and Invisalign treatment. He can perform surgical orthodontics if needed and pediatric orthodontics. When choosing a center for your family, you want one that can treat patients of all ages and a center whose staff knows how to work really well with children. You can find that at Dr. Hardy’s Belmar Orthodontics office by calling (303) 225-9016! Many patients expect their braces to come off, exposing a beautiful, white smile. However, the teeth are often not bright and sparkling when brackets and wires come off. This is why many patients opt to have teeth whitening treatments after their orthodontic treatment is over. You can even do it right after your braces come off. We can help you to know what you can expect when your braces come off and how to approach teeth whitening to brighten your smile! Avoid hard foods that will break orthodontic appliances. These include: nuts, popcorn, corn on the cob, carrots, hard candy, chips, ice, apples and crusty bread. Don’t eat sticky foods, which are really hard to get out of brackets. These include: gum, caramel, Sugar Daddies, Skittles, taffies, Tootsie Rolls, gummies, fruit snacks, Starburst, licorice and similar foods. Sodas and carbonated drinks. Carbonic acid in these drinks will erode tooth enamel over time. Juices and Citrus: Citric acid erodes tooth enamel as well. Juices are generally high in sugar and can contain acids. It’s also very important to keep your teeth clean. If you have drinks that are purple, blue, red, and other dark colors, these will all stain your teeth. When you do drink these drinks, make sure to brush afterwards (about 20 minutes after) to take away the dye. Keep your teeth clean all day long by continually brushing and flossing so your teeth can stay as white as possible. 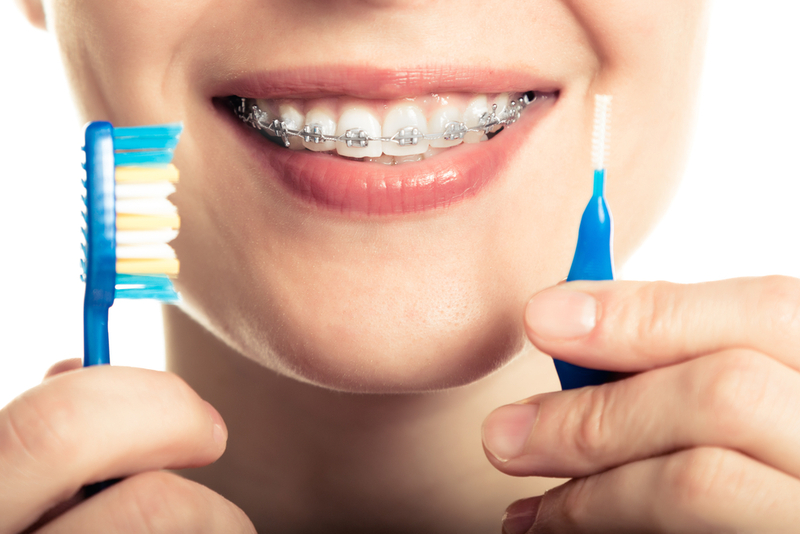 The more you do for your teeth when you have braces, the less you have to do afterwards. Many patients picture beautiful, white teeth when their braces come off. Even though your teeth will be beautiful and straight, they likely won’t be white. They will at least be the same color that they were when you got braces on your teeth. Depending on your oral health habits, your teeth might actually be darker if you had foods with dyes, tooth decay problems or didn’t brush and floss often. If your teeth aren’t white, don’t fret! Most patients do teeth whitening after their braces to get their new straight smile sparkling. Teeth whitening is one of the easiest dental services you can get. If you get teeth whitening through a dentist, you will have a dental hygienist whiten your teeth with professional-grade solutions. You will have teeth whitening materials placed on your teeth that will be set with ultraviolet light. Your teeth will then cure for 20-60 minutes until they reach the white shade you desire. This process can be done several times in-office on the same day, or spread out over several days if the teeth are sensitive. Dentists also provide take-home professional-grade solutions that patients can do on their own time that work much quicker than toothpastes, strips or over-the counter treatments. 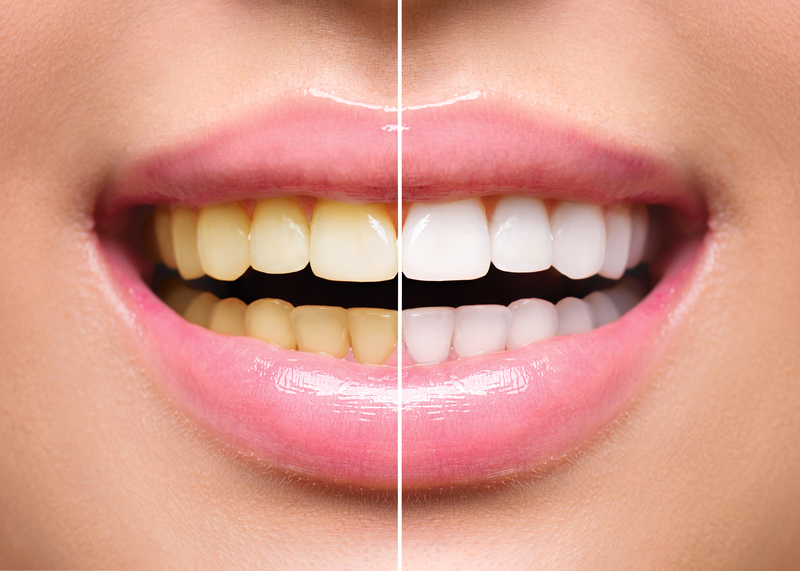 With any teeth whitening you do, always double check the chemicals being used and what the process will be like. With a professional service, your results are usually guaranteed or the process is redone. Many at-home products won’t whiten your teeth significantly. Many toothpastes only remove plaque or surface stains, but they don’t actually change the color of your teeth. When choosing over-the-counter products, look for ones with hydrogen peroxide or carbamide peroxide. These will actually change the shade of your teeth whiter. Your best and quickest results will come from getting professional teeth whitening from a dentist. Teeth whitening can even be done in just one office visit, which is great for upcoming formal events or whitening your teeth when you have very little time. Brush your teeth at least twice a day, for at least 2 minutes every time, as recommended by the American Dental Association. 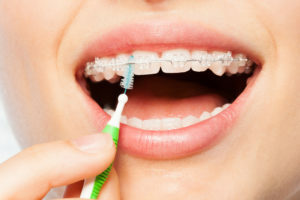 If you wear braces, you should brush your teeth after every meal. Floss every day, 1-2 times. Flossing gets 40% of your tooth surfaces that get missed when people skip. Use fluoridated toothpaste. Fluoride strengthens your teeth, and you can get fluoridated teeth whitening toothpastes. See your dentist! You need more than just an orthodontist, even though the orthodontist is very important. Seeing a professional who knows both orthodontics and dentistry is even better (like us). Every person should see their dentist for comprehensive exams and dental cleanings at least twice a year. See your orthodontist. 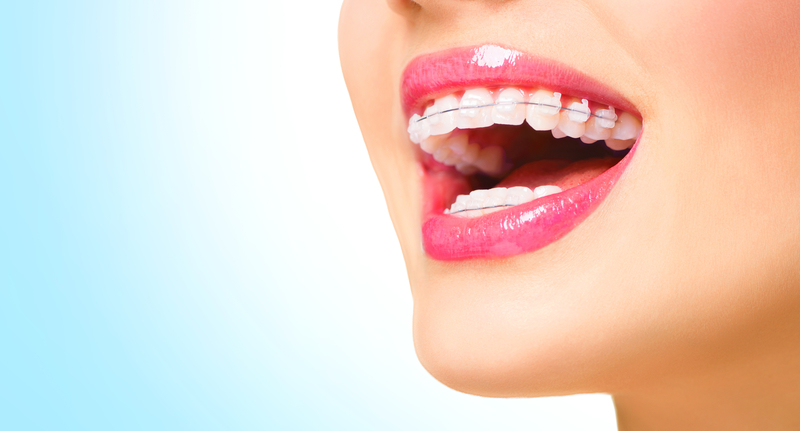 When wearing braces, make sure you go to every orthodontic appointment. This helps your orthodontist know if dental problems like decay, erosion or staining are happening. Following these guidelines can help you keep your natural teeth healthy and strong for life, even with your braces on. For more help taking care of your teeth or questions about teeth whitening after braces, call Belmar Orthodontics at (303) 225-9016!